The new stage adaptation of Paddy Chayevsky's iconic film Network opens at Broadway's Belasco Theatre on December 6. On the heels of an acclaimed London production, the play began main-stem previews on November 10. Tony winner Brian Cranston reprises his Olivier-winning performance as news anchorman Howard Beale for the Great White Way run. Written by Tony winner Lee Hall and directed by Tony winner Ivo van Hove, Network centers on Beale, who isn't pulling in viewers. In what is to be his final broadcast, he unravels live on screen, and as the ratings soar, Howard becomes the biggest thing on TV. Joining Cranston onstage is Emmy winner Tatiana Maslany in her Broadway debut as Diana Christensen, with Tony Goldwyn as Max Schumacher, Tony winner Frank Wood as Nelson Chaney, Joshua Boone as Frank Hackett, Alyssa Bresnahan as Louise Schumacher, Ron Canada as Edward Ruddy, Julian Elijah Martinez as Harry Hunter, Nick Wyman as Arthur Jensen, Barzin Akhavan as Jack Snowden/Warm-Up Guy, Susannah Perkins as Schlesinger and Nicole Villamil as Sheila. 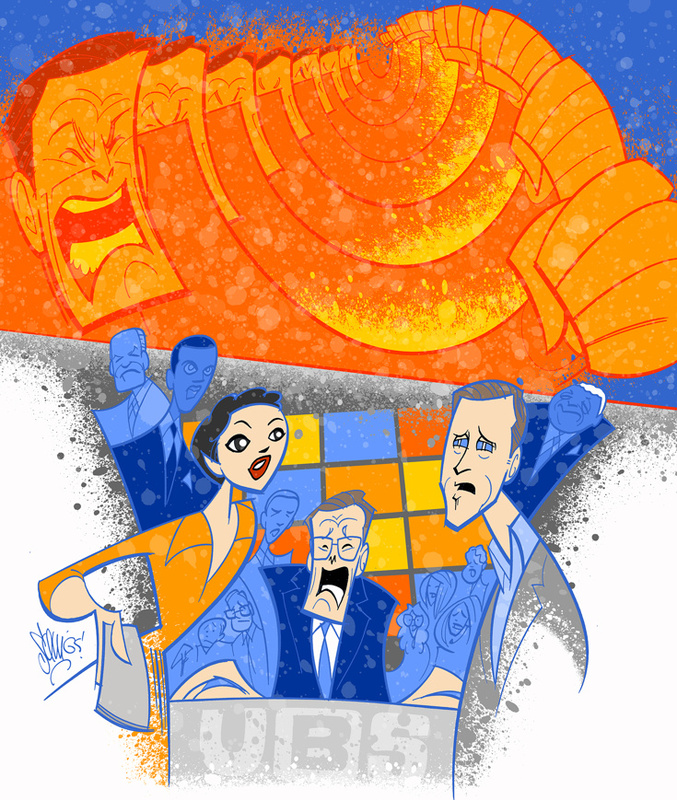 To celebrate opening night, Broadway.com Resident Artist Justin "Squigs" Robertson sketched a fiery portrait featuring Cranston surrounded by a talented company of stars reinventing an iconic film onstage. Bryan Cranston stars in the acclaimed stage adaptation of the iconic 1976 film.